The first World Fantasy Convention (WFC) was held in 1975 in Providence, Rhode Island (see retrospective of WFC) and it has continued as an annual gathering and reunion of professionals, collectors, and others interested in the field of light and dark fantasy art and literature. The convention is generally held on one of the two weekends bracketing Halloween, with some light early-bird programming usually beginning Thursday evening and the convention generally concluding Sunday afternoon, usually shortly after the World Fantasy Award Banquet. The awards banquet is a culminating highlight of the convention, offering awards ranging from lifetime achievement, to various aspects of art and literature. Additional highlights include an autograph reception, and often some sort of reception honoring the arts. Individual conventions often use programming and special events to highlight the themes of the convention and local flavor. 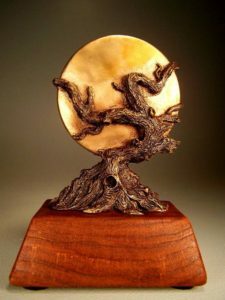 The World Fantasy Awards Administration and the Board of the World Fantasy Convention are delighted to announce that a new design has been chosen for the World Fantasy Award after a year-long public competition, which attracted a great many artists of extremely high caliber. It was a tough choice: the Awards Administration received a lot of entries, and at least half a dozen designs which would have made wonderful Award statuettes. However, by unanimous decision of the Administration, we have selected the model produced by award-winning sculptor and artist Vincent Villafranca (www.villafrancasculpture.com). The sculptor will be attending the 2017 WFC in San Antonio, Texas, where the awards will be presented for the first time.